We investigated the chemopreventive action of dietary curcumin on 7,12-dimethylbenz(a)anthracene (DMBA)-initiated and 12,0-tetradecanoylphorbol-13-acetate (TPA)-promoted skin tumor formation in Swiss albino mice. Curcumin, a yellow coloring matter isolated from roots of Curcuma longa Linn, is a phenolic compound possessing antioxidant, free radical scavenger, and antiinflammatory properties. It has been shown by previously reported work that TPA-induced skin tumors were inhibited by topical application of curcumin, and curcumin has been shown to inhibit a variety of biological activities of TPA. Topical application of curcumin was reported to inhibit TPA-induced c-fos, c-jun and c-myc gene expression in mouse skin. This paper reports the effects of orally administered curcumin, which was consumed as a dietary component at concentrations of 0.2 % or 1 %, in ad libitum feeding. Animals in which tumors had been initiated with DMBA and promoted with TPA experienced significantly fewer tumors and less tumor volume if they ingested either 0.2% or 1% curcumin diets. Also, the dietary consumption of curcumin resulted in a significantly decreased expression of ras and fos proto-oncogenes in the tumorous skin, as measured by enhanced chemiluminesence Western blotting detection system (Amersham). Whereas earlier work demonstrated that topical application of curcumin to mouse skin inhibited TPA-induced expression of c-fos, c-jun and c-myc oncogenes, our results are the first to show that orally consumed curcumin significantly inhibited DMBA- and TPA-induced ras and fos gene expression in mouse skin. Curcumin is yellow coloring matter isolated from roots of Curcuma longa Linn commonly called turmeric. It has been widely used in many Asian countries as a spice, to color cheese and butter, as a cosmetic and in some medicinal preparations. Curcumin (diferuloylmethane), a phenolic compound, possesses antioxidant, free radical scavenger and anti-inflammatory properties [1,2,3,4,5]. Several works in epidemiology and animal model studies demonstrated that compounds which possess antioxidant or anti-inflammatory properties can inhibit carcinogenesis [6,7,8,9]. One of the classic models is the inhibition of 12-0-tetradecanoylphorbol-13-acetate (TPA)-induced tumor promotion in mouse skin. TPA is a strong promoter of chemically induced skin cancer. It has been shown that TPA-induced skin tumors were inhibited by topical application of curcumin [10,11]. Curcumin can inhibit the activity of cytochrome P450 and increase GSH content in rat liver which help to explain anticarcinogenic, antimutagenic and cytoprotective effects of curcumin [12,13]. Many reports have shown that curcumin inhibits a variety of biological activities of TPA, which induces several biosynthetic processes, namely induction of ornithine decarboxylase , elevation or translocation of protein kinase C , induction of cyclooxygenase and lipooxygenase . Topical application of curcumin inhibits TPA-induced c-fos, c-jun, c-myc gene expression on mouse skin after 2 hours of TPA treatment . In present studies, we investigated the modulating effect of dietary curcumin on DMBA and TPA-induced tumor formation and on the expression levels of ras-p21 and fos-p62 to provide an understanding of the molecular basis of the relationship between the dietary curcumin and transforming function of oncogenic ras and fos during multi-stage skin carcinogenesis. Fig. 1 shows the changes in body weight. There was no significant difference in body weight changes between the control and 1 or 0.2% curcumin treated groups (P > 0.05). The effect of dietary curcumin on the tumorigenesis of DMBA and TPA was evaluated using the two-stage mouse skin model. 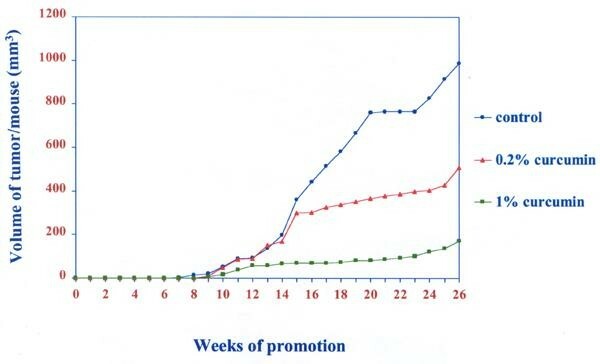 Animals receiving a single topical application of DMBA, followed by 26 weeks of promotion with TPA, when fed the control diet, developed 7.7 ± 1.4 papillomas/mouse (Fig. 2). The number of papillomas was significantly lower in the 1% and 0.2% curcumin diet group than in the control group (P < 0.05) dose dependent manner. Fig. 3 shows the average volume of tumors per mouse in the curcumin diet compared to the control group. The average volume was significantly lower in the 1% or 0.2% curcumin diet than in the control group (P < 0.01) dose dependently. No papillomas were observed in the groups which received the control diet or the diet supplemented with 1% or 0.2% curcumin or the vehicle with no application of DMBA and TPA. Changes in body weight in Swiss mice treated with control, 0.2% and 1% curcumin diets. Each point represents the mean value (N=20). Average number of tumors per mouse in Swiss mice treated with control, 0.2% and 1% curcumin diet. Each point represents the mean value (N=20). Average volume of tumors per mouse in Swiss mice treated with control, 0.2% and 1% curcumin diets. Each point represents the mean value (N=20). Fig. 4a and 4b demonstrates the representative examples of Western blot analysis of membrane-bound ras-p21 and nuclear fos-p62 protein. The samples exhibited detectable levels of p21 with c-Ha- anti-ras-21 mouse monoclonal antibody and levels of p62 with anti-fos-62 rabbit polyclonal antibody. Regardless of dietary regimen, very low (background) levels of ras-p21 and fos-p62 were detected in acetone treated animals (data not shown). 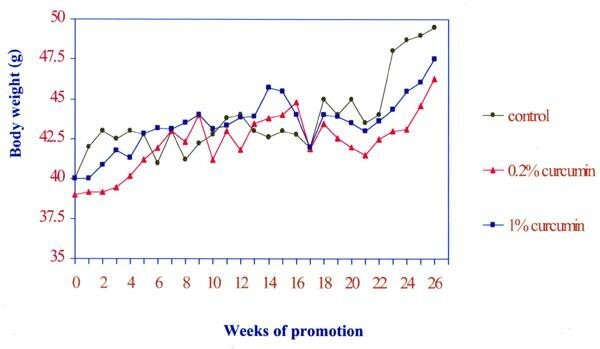 The mice receiving a single topical application of DMBA, followed by 26 weeks of promotion with TPA developed increasing higher levels of skin ras-p21 and fos-p62 expression in all dietary groups. Skin tumors exhibited higher levels of ras-p21 and fos-p62 than the normal skin. The enhanced expression of the ras-p21 and fos-p62 in skin tumors was decreased by curcumin diets of 1% and 0.2% dose dependently as compared with ras-p21 or fos-p62 in the mouse counterparts on control diet (p < 0.05). Table 1. summarizes the densitometric analysis of differential expression of ras-p21 and fos-p62 in tumorous and non-tomorous skin of DMBA and TPA-treated animals fed the control, 1 or 0.2% curcumin diets. Effect of dietary curcumin on expression levels of c-Ha-ras (p21) and c-fos (p62) in skin of DMBA and TPA treated animals (N = 20). T = Tumorous skin N = Non-tumorous skin aResults are expressed as arbitary unit; values are mean ± SD. bValues in parentheses relatively represent percentage of ras or fos gene expression. The levels of ras and fos proteins in the control diet are represented as 100%. Results of this study demonstrate that 0.2% or 1% dietary curcumin inhibit the DMBA- and TPA-induced enhanced expression of ras and fos oncogenes and suppress skin tumor development. Previously, data from our laboratory have demonstrated that animals fed high amounts of dietary curcumin (1%) had significantly lower multiplicity of TPA-induced skin papillomas compared with their counterparts ingesting control diet . So in the present study we demonstrated the inhibition of tumor development at the lower concentration of curcumin (0.2%) to minimize the possibility of overconsumption of curcumin. Our previous data (not shown here) has shown that at higher concentration of curcumin (2%) did not show as good inhibitory effect as the lower concentration (1%). It may due to the second effect of curcumin which may not be of benefit for prevention of carcinogenesis. Our results are in agreement with other reports on the inhibitory action of turmeric or curcumin on carcinogenesis in different experimental designs. Azuine and Bhide demostrated that Swiss mice with multiple doses of DMBA for eight weeks applied on their back and fed 2% turmeric diet developed less tumors than those fed standard diet . Curcumin has already been linked to lower rates of forestomach, duodenal and colon cancer. Administration of 0.5-2% curcumin in the diet decreased the number and size of benzopyrene-induced forestomach tumors in A/J mice, N-ethyl-N'-nitrosoguanidine-induced duodenal tumorigenesis and azoxymethane induced colon tumorigenesis in CF-1 mice . A 1% turmeric diet suppressed benz(a)pyrene-induced forestomach tumors and spontaneous mammary tumors in mice . Dietary curcumin at the concentration of 500 ppm (equivalent to 0.05%) inhibited 4-nitroquinoline 1-oxide induced oral carcinogenesis in F344 rats . Kakar and Roy  demonstrated that topical application of curcumin on mouse skin inhibited TPA induced expression of c-fos, c-jun and c-myc oncogene. Our results are the first report which demonstrate that dietary curcumin significantly inhibited DMBA- and TPA-induced ras and fos gene expressions in mouse skin. Curcumin may block a certain point on the signal transduction pathway leading to fos and ras oncogene expression. DMBA and TPA were purchased from Sigma (St.Louis, MO, USA). Commercial curcumin (77% curcumin, 17% demethoxycurcumin, and 3% bisdemethoxy curcumin, Fig. 5) was purchased from ICN Biomedical (Costa Mesa, CA, USA). Feed ingredients (casein, methionine, mineral and vitamin mixtures, cellulose and choline bitartate) were purchased from ICN Biomedical. All other chemicals were of AR grade. Male Swiss albino mice, 5 weeks old, were purchased from the National Laboratory Animal Center, Thailand. All diet ingredients were stored at 4°C prior to the preparation of diets. The mice were quarantined for 7 days and had access to modified AIN-76A diet. Following quarantine, all the mice were randomly distributed by weight into various groups and were housed individually under controlled conditions of a 12-h light/12-h dark cycle and 22 ± 2°C. In all treatment groups the mice were fed a modified AIN-76 diet (control diet). The control diet had the following composition (g/100 g): 20 casein, 0.3 DL-methionine, 3.5 mineral, 1 vitamin, 5 cellulose, 5 corn oil, 32 corn starch, 33 sucrose, and 0.2 choline bitartrate. In some treatment groups, the control diet was modified by the addition of 1% or 0.2% curcumin (Table 2). The incorporation of curcumin into the diet was done with a V-blender after curcumin was premixed with a small quantity of diet in a food mixer to ensure its uniform distribution. All feeds were pelleted to avoid stratification and to ensure uniform feed and curcumin intake in the treated animals. All control and experimental diets were prepared every 2 weeks in our laboratory and stored at -20°C before use. The mice had access to food and water at all times, and food cups were replenished with fresh diet three times weekly. As indicated in Fig. 6, beginning at 6 weeks of age, groups of animals were fed the control diet or the experimental diet containing 1% or 0.2% curcumin. At 8 weeks of age, groups of animals were started on carcinogen treatment. The mice were sorted into the following treatment groups (20 mice/group). One group of mice were fed the control diet and treated with DMBA and TPA on the skin. Some groups of animal were fed the control diet supplemented with 1% or 0.2% curcumin and similarly treated with DMBA and TPA. The vehicle (acetone solvent) chemical control groups were fed the control diet or the curcumin diet and treated with acetone on the skin. Animals were maintained on control or curcumin diets until the termination of the experiment. The backs of mice were shaved with electric clippers 3 days before the first skin treatment and thereafter were shaved when needed for the duration of the experiment. Carcinogen or vehicle solvent (acetone) was applied to the dorsal shaved area. 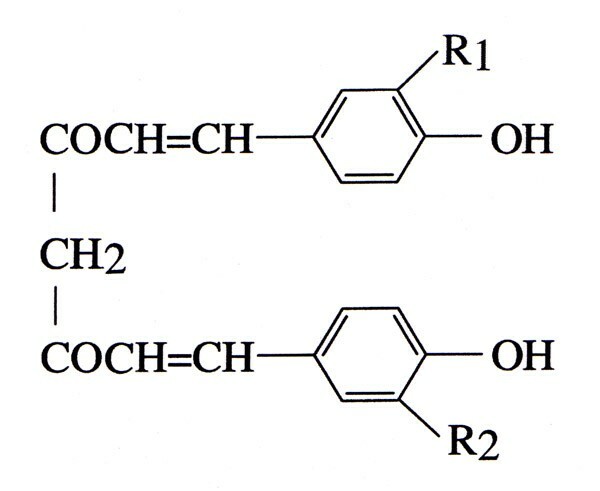 All of the animals which were subjected to tumor initiation and promotion received 100 μg of 7, 12-dimethylbenz [a]anthracene (DMBA) dissolved in 100 μl of acetone in a single application to the skin of the back. 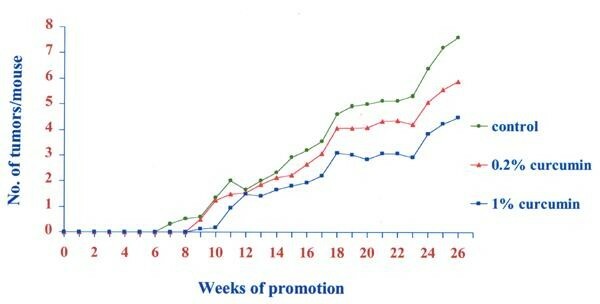 From 1 week after DMBA application, tumor promoter, 2.5 μg of 12-0-tetradecanoyllphorbol-13-acetate (TPA) dissolved in 100 μl of acetone, was applied to the same areas on mouse skin twice a week for 26 weeks (Fig. 2). The vehicle control groups received only 100 μl of acetone to the skin of the back. Mice were weighed at weekly intervals. Tumors appearing on mouse skin were counted and measured by a Pierre Vernier caliper weekly throughout week 26. The average tumor volume was calculated as (length) × (width) × (height) π/6. The data were analyzed by Student's t-test and chi-square test. After 26 weeks of TPA application, pooled tumors and non-tumorous mouse epidermis from each experimental group (control diet, 1 and 0.2% curcumin diet) were collected. The skins were excised and placed in a water bath at 60°C for 30s and then submerged in liquid nitrogen . The tumors were rapidly removed and frozen in liquid nitrogen and the non-tumorous epidermis was removed from the dermis by gentle scraping and then rapidly frozen in liquid nitrogen. The samples were stored at - 70°C until used for western blot analysis. The c-fos and c-Ha-ras proteins were analyzed by enhanced chemiluminescence (ECL) Western blot analysis using specific anti-p62 fos and anti-p21 ras antibodies, respectively. The pooled tumors and nontumorous mouse epidermis from each experimental group (control diet, 1 and 0.2% curcumin diets) were washed with cold phosphate buffer saline and suspended in 1 ml of buffer A (20 mM Tris-HCl, pH 7.5, 5 mM MgCl2, 1 mM EGTA, 1 mM DTT, 1 mM phenylmethylsulfonyl fluoride (PMSF), 20 μg/ml aprotinin, and 10 μg/ml leupeptin). The suspension was homogenized in a glass homogenizer with 30 strokes and centrifuged at 700 g for 5 min to remove unbroken cells and nuclei. The nuclear pellet was used for fos preparation. The supernatant was further centrifuged at 100,000 g for 30 min. The membrane pellet was resuspended in 1 ml of buffer B (1% NP-40, 0.5% sodium deoxycholate, 0.1%SDS, 0.6 mM PMSF and 1 mM sodium orthovanadate in PBS pH 7.4), rocked for 1 h, and then centrifuged at 100,000 g for 30 min. The supernatant was used as membrane fraction for ras-p21 analysis and stored as aliquots at -80°C. The nuclear extract was prepared by the method of Dignam et al. as follows: the pellet obtained from the low speed centrifugation of the homogenate was resuspended in buffer C (20 mM HEPES pH 7.9, 25% glycerol, 0.42 M NaCl, 1.5 mM MgCl2, 0.2 mM EDTA, 0.5 mM PMSF, 0.5 mM DTT) and was stirred gently with a magnetic stirring bar for 30 min at 4°C and then centrifuged for 30 min at 25,000 g (Sorval SS34 rotor), and the supernatant was dialysed against 50 volumes of buffer D (20 mM HEPES pH 7.9, 20% glycerol, 0.1 M KCl, 0.2 mM EDTA, 0.5 mM PMSF, 0.5 mM DTT) for 5 h. The dialysate was centrifuged for 20 min at 25,000 g (Sorval SS34 rotor) and the resulting precipitate discarded. The supernatant, designated the nuclear extract, was frozen as aliquots in liquid nitrogen and stored at -80°C. The protein contents in both nuclear and membrane fractions were determined with Bio-Rad reagent. SDS-PAGE and Western transfers were carried out essentially by the methods of Laemmli  and Towbin et al . Nuclear and membrane extracts corresponding to 25 μg of protein were solubilized in Laemmli's sample buffer. Samples were boiled for 3 min and resolved by extended electrophoresis on a 12.5% polyacrylamide mini- slab gel containing SDS with an overlay of 4% polyacrylamide, along with prestained SDS-PAGE molecular weight markers and the ras-p21 Western blot standards (Oncogene Science, Manhasset, NY). Electrophoretically resolved proteins were electrotransferred onto Hybond ECL membrane in a Trans-blot electrophoretic transfer cell (Bio-Rad Laboratories). 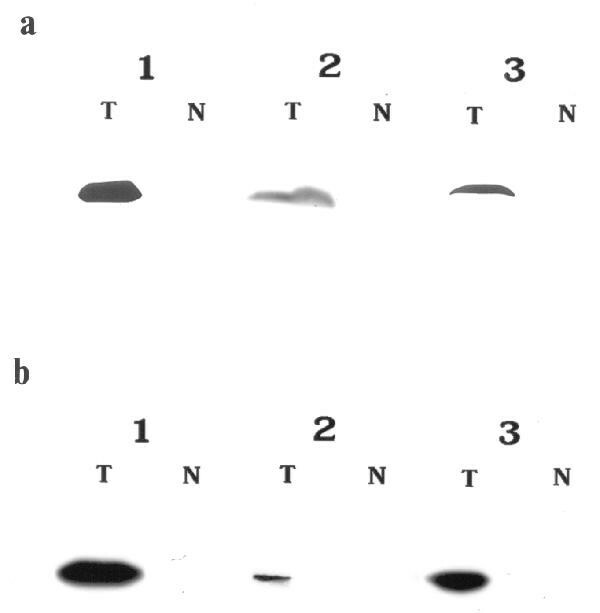 After transblotting the electrophoretically resolved proteins, the blots were blocked with 5% nonfat dry milk dissolved in Tris-buffered saline containing 0.2% Tween-20 (TBST). Blots were then incubated with specific monoclonal antibody to c-Ha-ras protein (Santa Cruz Biotechnology) diluted in TBST and reincubated with peroxidase-linked secondary antibody (antimouse IgG; Amersham) diluted in TBST containing 0.5% nonfat dry milk. The blots were then throughly washed in excess TBST and probed with the ECL. Western blot detection system (Amersham) using reflection autoradiography films was performed according to the manufacturer's instructions. The autoradiograms were scanned with an Image Master sharp laser densitometric scanner, and the peak areas representing ras-p21 bands were determined. Western blot analysis of the fos protein was performed by the same protocol as described above except in the detection system, the specific antibody to c-fos p62 protein (Santa Cruz Biotechnology) was used instead of specific antibody to ras-p21 protein. This work was supported by Grant No. 95A98-REV from the American Institute Cancer Research. We thank Ms. Kanchana Kaewmanee for her excellent help in the preparation of this manuscript.